This post is part of our new series, The Ethnographic Case. One doctor, seven medical students and an anthropologist crowd into the patient’s very small hospital room. The doctor places his briefcase next to the bed, introduces himself to the patient and turns to his students. Whose turn to do a respiratory examination? Mumbling, shuffling, staring at shoes but soon a volunteer. First inspection, palpation and then the tricky techniques of percussion and auscultation; that is, tapping out body sounds one finger on another, and listening to the patient’s breathing through a stethoscope. The student isn’t sure if he is finding a dull note when he percusses one part of the patient’s back, as she hunches awkwardly forward in her cotton gown. The other students are watching and sneaking a few taps on their own chests, practicing their swing. How to tell if the note is dull? The doctor teaches the students a trick, while the patient looks on, listening in to the lesson too. The students should tap their own thighs, for that is a dull sound and a dull feel. You always have yourself as a gold standard, he tells them; use this! Excuse yourself to the toilet if you have to, tap away and remember that sensation. I observed many instances of self-percussion during my fieldwork researching how listening to sounds is learned, taught and practiced in a Melbourne medical school and it’s connected teaching hospital. The students were sounding out their own bodies; practicing the technique while also feeling “dull” or “resonant” on their own body. This knowledge was then to be applied during their examination of patients, where dullness or resonance in the “wrong” place or in uneven distribution, may indicate disease. Tom Rice (2013) also observed similar acts of self-listening in a London hospital, in the form of auto-auscultation. The first sounds a medical student listens to, Rice found, when they buy their first stethoscope, are often their own. What does it mean to use your body as a case for others? Medical students (and indeed many other practitioners of the body) do this all the time. It is a common way of learning new bodily skills and bodily knowledge. Learning to listen. From Wellcome Library, London. When students take their own body as a case they are learning not from a pickled body part or cadaver, nor from written descriptions of symptoms and signs, but from their living, breathing body that creaks and pulses and moves. There is a sense of delight and discovery as students learn to listen to their heartbeats through stethoscopes, when they discover hollow and dull spaces in their abdomen and chests. Through this self-listening students are experimenting with their bodies, learning through the sensations they experience and bring about with their own bodily practices. Doctors and medical students are not the only ones listening to their own bodily sounds in medical settings. Patients do too, although this is regarded as a pathological rather than pedagogical event. In the medical literature, self-listening is referred to as autophony, a word that could also be used to describe what the medical students are doing too. In the medical case however, autophony is an “abnormality”, described as a form of “hyper-perception”. For most people, sounds from inside the body are “screened out”, so as to make the outside world audible. For patients with medical conditions inducing the effect of autophony (such as a small crack in the bone protecting the delicate semicircular canals for example), the torrent of internal sounds, necessarily inaudible to most of us, can be heard and are dramatically amplified. Patients may be able to hear their eyeballs moving from left to right, the pulsing of blood or the gurgles of digestion. I first heard of a patient suffering from autophony during my fieldwork, from one of the nurses with whom I spent time. Curiosity led me to the medical literature, where I found the condition documented largely through case studies. Take for example, two case reports in the Journal of Neurology, Neurosurgery and Psychiatry which describe the “unusual but fascinating” symptoms of autophony (Albuquerque and Bronstein 2004). The first case is a 53 year old woman who presents with a tendency to stumble to the left side of her body. Questions about tinnitus reveal that the patient describes sounds of increasing pitch when she rolls her eyes upwards and decreasing pitch when she rolls then down. Case 1 is noted as saying she could play a tune with her eyes. Case 2 is a 32 year old man, also falling to the left, this time when he hears loud sounds such as a telephone ringing. He can hear his own heart beats, bone taps and footsteps. Case 2 is reported to complain of “a soft low pitched sound in his left ear ‘rather like moving a hard-pressed finger across a clean, wet china dinner plate’ when he moved his eyes” (Albuquerque and Bronstein, p1364). For these cases/patients, inner movements of tendons stretching and blood pumping are constantly heard. Their descriptions of these sounds are unusual, which make them such nice case studies. In medical cases the intriguing and fascinating are plucked from the mundane. Something is learned from the unusual. In ethnographic cases, it is often the other way around and mundane acts such as tapping on your chest are made more intriguing and fascinating through description and situation within other stories. Whether rare or mundane, the same question arises for both medical and ethnographic cases, as it does for students tapping out their own bodies: How to move from one case to others? To move from the case study to others, interpretations need to be made. For a case to become meaningful in other sites, similarities, as well as differences, are found and compared. A medical student compares sounds from their thigh with those tapped on a patient’s back. A clinician reading the medical journals compares case studies with patients in her clinic. An anthropologist compares their ethnographic findings with other accounts in the literature: Melbourne hospitals compared to London hospitals. These cases, like their brief and suit versions, travel. As Annemarie Mol has pointed out in the previous post in this Casestudies series, cases do not always transport knowledge easily though; interpretation takes work. What might be taken from these cases of autophony in medicine, of students and patients listening to their bodily sounds, presented here side-by-side? They might teach us that through acts of self-listening bodily borders are crossed, blurring inside/outside and in the process, not only does one’s own vitality, amazingly, at times horrifyingly, emerge, but the possibility of other’s too. Patients suffering from autophony, like tinnitus, might try to pay less attention to these sounds. The medical student is taught to be aware, to listen to their own body, a fleshy textbook they carry with them at all times, so as to listen better to the bodies of their patients. And the anthropologist? How do we listen in? And when we do, what does it do to our stories of the world when we use our own sensing, moving, living bodies as a case for others? Anna Harris studies the sensory, bodily, material practices entailed in medical work. She has conducted ethnographic research concerning migrant doctors, genetic testing, sound in hospitals and is currently establishing a project on technologies in medical education. She blogs regularly at www.pneumaticpost.blogspot.com. 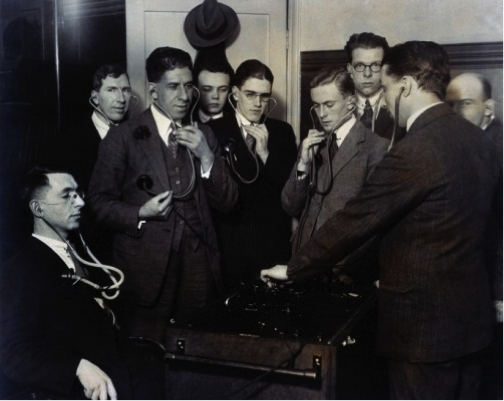 This post is based on research that was conducted as part of a Dutch (NWO, Vici) funded research project entitled “Sonic Skills: Sound and Listening in the Development of Science, Technology, Medicine (1920–now)” led by Karin Bijsterveld at Maastricht University, the Netherlands. Albuquerque, W. and A. Bronstein (2004) ‘Doctor, I can hear my eyes’: Report of two cases with different mechanisms. Journal of Neurology, Neurosurgery and Psychiatry 75: 1363 – 1364. Rice, T. (2013) Hearing and the Hospital: Sound, Listening, Knowledge and Experience. Canon Pyon: Sean Kingston Publishing. Harris A. Autophony: Listening to your eyes move. Somatosphere. 2015. Available at: http://somatosphere.net/2015/autophony-listening-to-your-eyes-move.html/. Accessed April 26, 2019. Harris, Anna. 2015. Autophony: Listening to your eyes move. Somatosphere. http://somatosphere.net/2015/autophony-listening-to-your-eyes-move.html/ (accessed April 26, 2019).